This book covers a field of electronics which is very mathematical and which presents difficulties to electronics students at all levels. It aims to provide the reader with enough maths to really understand what electronic filters are, how they work and how to use them. The book assumes a knowledge of mathematics at about GCSE level, and a minimum of electrical and electronic theory. It proceeds by easy stages to describe the structure, action and uses of filters, introducing and explaining the necessary additional maths at each stage. The discussion is backed up by descriptions of practical working filters of all types. 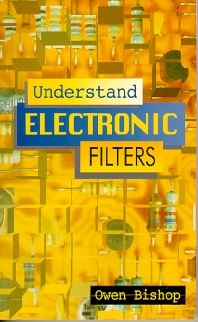 All the filter circuits contained within the book are simulated on computer, and this provides a wealth of computer-generated diagrams and accurate graphs, many in 3-D, to illustrate the text. To ensure the reader is confident with what they learn, short sets of questions are included periodically throughout the text under the heading Keeping Up? At the end of each chapter there is a more demanding set of Test Yourself questions, designed to reinforce the understanding acquired by reading each chapter. Answers are given at the end of the book. Filter components; Electrical signals; Directed quantities; Representing vectors; Passive filters; Transfer functions; Resonant circuits; Op amps; Active filter responses; State variable filters; Switched capacitance filters; Voltage-controlled filters; Digital filters; Filtering by DSP.